The accelerating advancement in research in neurodevelopmental disorders -- including autism spectrum disorders, attention-deficit/hyperactivity disorder, learning disorders, and more -- has enormous implications for clinical practice. Autism and Other Neurodevelopmental Disorders provides clinicians with up-to-date information on the impact these advances have on the standard of care in the range of disorders commonly encountered by both primary and subspecialist physicians. The authors, affiliated with the UC-Davis MIND Institute, explain the latest findings from the biological, behavioral, and clinical sciences in ways that are accessible to clinicians and helpful to patients and their families. Specific features include: A uniform chapter structure that makes it easy for the reader to locate material and make comparisons between and among disorders. 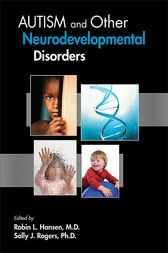 Each chapter addresses signs and symptoms (including onset and developmental course); epidemiology and etiology (including known genetic and environmental contributors, biological mechanisms and relevant animal models); diagnostic criteria; differential diagnosis and comorbidities; and evidence-based interventions. The inclusion, where possible, of current draft DSM-5 diagnoses, as well as DSM-IV. Practical focus on psychological/behavioral and medical issues, as well as other supports and resources for patients, their families, and the community. Emphasis on current, ongoing research that holds promise for future clinical care. Identification of new research directions and needs. A comprehensive chapter devoted to the effects each of the neurodevelopmental disorders has on language and social communication. Replete with tables, illustrative figures, key points, and suggestions for further reading, Autism and Other Neurodevelopmental Disorders helps clinicians meet the challenge of providing the most up-to-date and effective care for their patients. Robin L. Hansen, M.D., is Professor of Clinical Pediatrics, Director of the Center for Excellence in Developmental Disabilities, and Director of Clinical Programs, The MIND Institute, University of California Davis Medical Center, Sacramento, California. Sally J. Rogers, Ph.D., is Professor of Psychiatry and Behavioral Sciences, The MIND Institute, University of California Davis Medical Center, Sacramento, California.